Apply for the Mathematics for Life Foundation [M4L] 2019 National Essay Competition (NEC), See Eligibility and Application Guidelines. Are you a Nigerian? 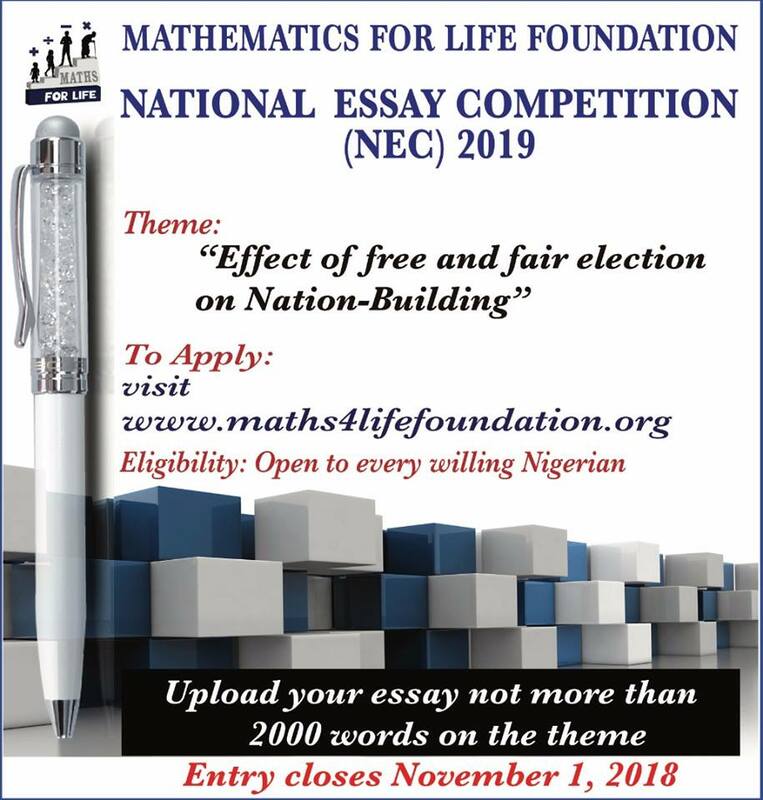 You should consider participating in the National Essay Competition featured in the AMCE 2019 being organized by @maths4lifengo. Mathematics for Life Foundation (M4L) is a registered charity with the Corporate Affairs Commission of Nigeria (CAC/IT/NO:93977). It's vision and mission are to use Mathematics as an innovative and unique tool to educate every willing Nigerian and in the process improve the quality of education and human life across all levels. "Effect of Free and Fair Election on Nation-Building"
Click on the Submit application for 2019 National Essay Competition (NEC) link to begin online registration. Upload your essay not more than 2,000 words on the theme. Entry Closes on November 1st, 2018.